DURHAM, N.C. – His label is heir apparent, but his experience suggests more than a hint of a returning starter. 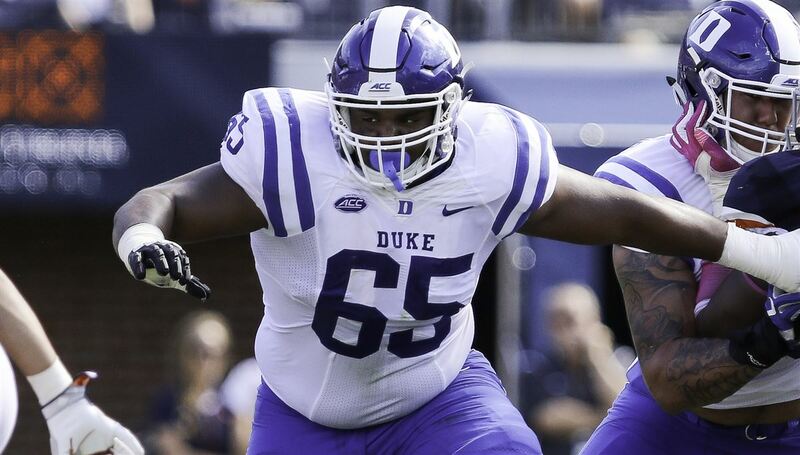 Quentin Harris looked and sounded like a veteran as Duke wrapped up spring drills last week, although in reality the redshirt senior has only two career starts while playing behind Daniel Jones, a third-year starter projected as an NFL first-round draft pick at the end of the month. In Duke's Spring Showcase on April 5 at Wallace Wade Stadium, Harris accounted for three touchdowns – one passing, two rushing – under scrimmage conditions. Harris will be labeled a first-year starter when Duke opens its season as heavy underdogs against the Alabama Death Star on in the Chick-fil-A Kickoff on Aug. 31 at Mercedes-Benz Stadium in Atlanta, but he’s checked more boxes than most new starters. He points to experience that includes more than his two starts after Jones was sidelined by a broken collarbone in the second quarter of the season’s second game at Northwestern. Harris preserved the victory over Northwestern when he was thrown into the fire, started wins over Baylor and N.C. Central and took all the reps as the starter in preparation for Virginia Tech until Jones was cleared to play on game day. Harris finished 2018 playing in 12 games, completing 34 of 68 passes for 437 yards with seven touchdowns and only one interception. He ran 46 times for 195 yards (4.24 per carry) with five touchdowns. In all, he has played in 23 games, with 10 in 2017 and one in 2016. In the spring game, the 6-foot-1, 195-pounder from Wilton (Conn.) Taft looked a field general. He completed 7-of-11 passes for 69 yards and rushed six times for 31 yards. He completed an 8-yard TD pass to rising sophomore wide receiver Jake Bobo and ran for scores of six and seven yards. If you’ve listened to Harris speak, he always sounds like a starter and team leader. He is a self-assured person that speaks with the eloquence of a great orator. Nevertheless, a quarterback needs pieces around him for the Blue Devils to compete against Alabama and earn a seventh bowl trip in the last eight seasons. On the offensive line, there is interior experience with redshirt junior Jack Wohlabaugh (6-4, 300), senior guard Julian Santos (6-3, 310) and junior guard Rakavius Chambers. Santos, despite his experience spanning 35 games and 20 starts, was named one of the two players as Most Improved on Offense for the spring. “It shows everybody has the capacity to improve,” Harris said. “It shows the maturity and the jump he’s been able to make this spring. At tackle, Robert Kraeling returns as a redshirt junior, although he was ill for much of the spring. There is competition at the other tackle spot. Sophomore Casey Holman (6-4, 295) and redshirt sophomore Patrick Leitten (6-7, 265) were backup tackles last year, but true freshman Jacob Monk (6-3, 299), an early enrollee for spring football from Corinth Holders in Wendell, started in the Spring Showcase. Two others in the mix are redshirt freshman Peace Addo (6-6, 310) and redshirt junior Jaylen Miller (6-3, 310). Three senior starting wide receivers graduated, but talent among the returning lettermen includes Aaron Young (6-2, 205), Jake Bobo (6-4, 190), Scott Bracey (6-2, 210) and Damond Philyaw-Johnson (6-1, 170). The other Most Improved Offensive Player making a quick mark was Darrell Harding Jr. (6-4, 200), a true freshman early enrollee. The tight ends also are young with two seniors gone, but Noah Gray (6-4, 240) caught 20 balls for 234 yards and one touchdown with one start. The other lettermen are Mark Birmingham (6-4, 245) and Jake Marwede (6-5, 240), although Marwede is still rehabbing from a November knee injury. The backfield has depth with redshirt junior Brittain Brown a returning starter now healthy from injuries last year and junior Deon Jackson (6-0, 220), who started eight games in place of Brown. Jackson earned second-team All-ACC honors with 161 carries for 847 yards rushing and seven touchdowns and 26 catches for 253 yards and one TD. Marvin Hubbard III and Mateo Durant also have starter talent, although Hubbard ruptured his Achilles’ in November and Durant suffered a shoulder injury in spring drills. The next phase of Harris’ leadership takes place in the off-season when the players gather to work out on their own before camp opens.